How is the situation for Dutch gas storages? Well….the business case is not looking good at all. The Dutch energy market regulator ACM asked KYOS to look into the role transport costs on the business case for gas storages in the Netherlands. KYOS’ research revealed that the tough market situation for gas storages is aggravated in the Netherlands by the high transport costs, which are considerably higher than in Germany. How can the transport costs for storages in the Dutch and German gas markets be compared, considering the differences in storage parameters, tariff structures and market practices? Are transport costs for storage facilities higher in the Netherlands than in Germany? 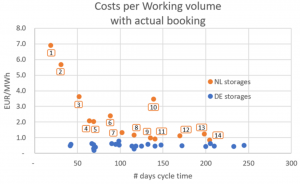 What is the impact of high transport costs on the business case of Dutch storage facilities? What is a likely course of action when a storage operator is confronted with a prolonged period of depressed margins? A little background: the ACM is the Dutch energy market regulator, and as such responsible for setting the prices of gas transport costs. Gasunie Transport Services (GTS) is the owner and operator of the national transmission network in the Netherlands. They apply these set transport tariffs to the storage companies and other users of the transmission network. Dutch gas storages have long-term (often 10-year) contracts with GTS for access to the network and hence pay the (high) annual transport fees. Gas storages have more or less been forced to go along with these contracts in order to be connected to the network and/or to have sufficient certainty about the availability of the network connection. KYOS has performed an in-depth analysis with the KyStore model to determine the optimal storage flows of all Dutch storages and (most of the) German storages in storage year 2016, from 1 April 2016 to 1 April 2017. In this backtest, on each day the KyStore model ‘knows’ the current inventory level, the spot and forward prices, and the market price volatilities. It uses this information to determine the optimal injection or withdrawal. Note that a few dozen market players use the KyStore model to support their storage trading decisions. Instead of using actual historical flows, the use of optimal flows ensures that all storage facilities are treated equally in the analysis. For example neutralizing the impact of storage interruptions and maintenance. Secondly, this approach makes it possible to analyze different cases, in particular assuming either daily or annual bookings. The KYOS analysis supports the claim of VGN about transportation costs. Indeed, Dutch storage users pay several times more than their German counterparts. The long-term contracts result in annual bookings, which are considerably more expensive than daily bookings. Storage users in the German market, in contrast, primarily book per day, and hence pay much less. So yes, we found that Dutch storages pay considerably more than German storages. 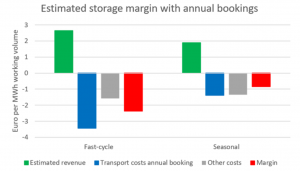 Even worse, the high transport costs lead to negative operating margins for Dutch storage facilities, both fast-cycle and seasonal storages. 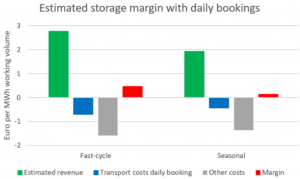 However, our analysis also shows that, under current market conditions, a switch from annual to daily transport bookings leads to slightly positive margins for the average fast-cycle and seasonal storage. Only after the long-term agreements with GTS have run out, storage operators effectively have two options. Either close down operations, or (for some of them) connect to the German grid. In cases where termination of the long-term agreements coincides with large maintenance, continuing operations on the Dutch TTF market may no longer be justified. There are a few reasons why storage facilities may potentially withdraw from the Dutch market. First of all, because of poor market conditions. Secondly, due to the implementation of a new European network code (NC TAR) in 2020. This will lead to a higher discount on the transport tariffs, from 25% to 50%. Even so, ACM has decided not to change the transport fees for storage operators in the Dutch market. Despite compelling arguments like the bad business case and the comparatively high levels of transport costs. The full report can be downloaded from the KYOS and ACM website. Please feel free to contact us for more information, for example about the methodology (using KyStore), or about the business case of individual storage facilities in the Netherlands, Germany or elsewhere. You can leave your details on the form below.